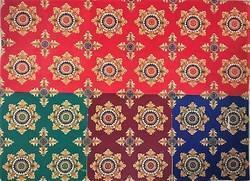 We have different range of Non Woven Printed Carpet. Our company is considered as one of the leading manufacturers & exporters of Exhibitions & Tent House Carpet. We use latest technology and infrastructure to produce Non-woven Carpet up to 10 feet width. 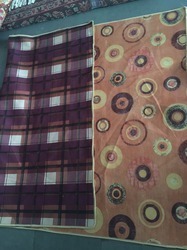 The fabric is available in variety of Sizes, GSM and Shades. Coated Fabric carpet is available in different colors and in 5 different sizes to meet the requirement of the clients. These carpets are tested on various parameters to ensure their features such as moth proof quality and abrasion & stain resistant surface. The regular available sizes are 3', 4', 5', 6' & 10' feet’s'. The Special Size and Shades are also available on request. The standard shades are Green, Green-Black, Peacock Blue, Light Grey, Dark Grey, Black, Magenta, Orange, Gold, Rust, I.D. Brown, purple Dark Blue, Red, Red-Black, Light Brown, Camel, Dark Brown, etc. 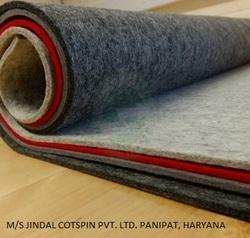 Non-woven Coated Fabric carpets are manufactured from different kinds of fibers as per the requirement of the clients. Non-woven Coated carpet are mainly used as wall to wall Covering in Exhibitions, Offices, Cinema halls, House hold purpose, etc. Exhibitions, fairs, multiplexes, conference hall, interior decoration, institutional market, tent house. Approx 30 to 45 Mtrs. print will be both side with different pattern. Looking for Non Woven Carpet ?